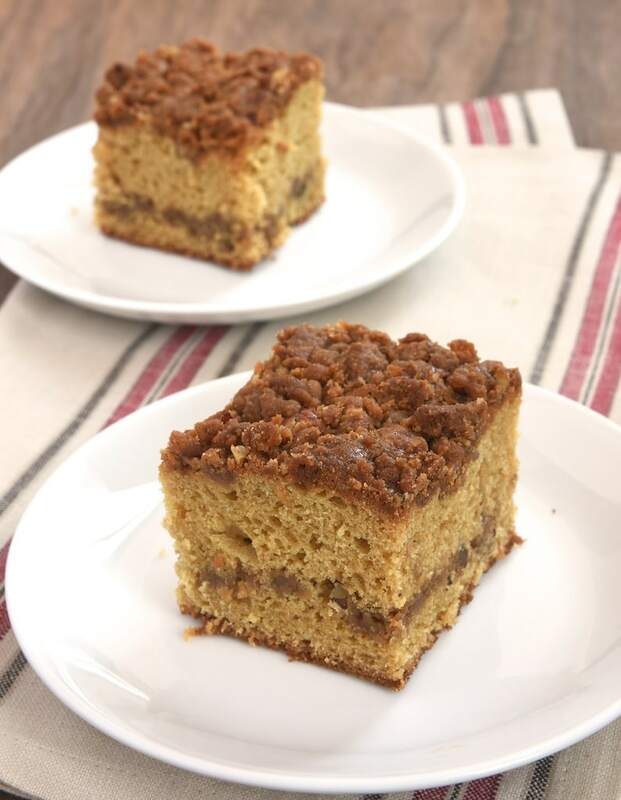 Every time I bake a coffee cake, I envision myself sitting on our serene rooftop wearing a big, thick cardigan and sipping hot coffee while I eat a dainty slice of said coffee cake. In reality, there are some issues with that image. First of all, who has time to sit around? Secondly, the construction on our block makes our rooftop anything but serene these days. Also, I don’t drink coffee. 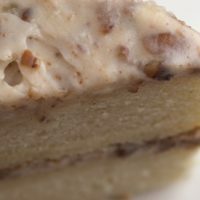 The one thing that’s so perfectly right about that image is the presence of coffee cake, although not usually a dainty slice. 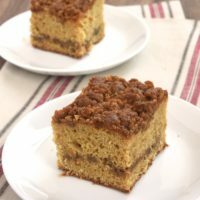 I have a long-standing baking/eating love of coffee cake. They appeal to me on many levels. They’re usually a no-fuss recipe. They tend to be a bit more subtle on the sweetness scale. 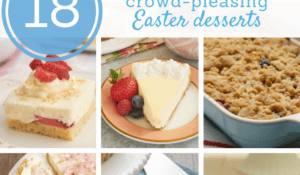 There’s almost always a crumb topping. And, best of all, they’re an excellent excuse to eat cake most any time of day. 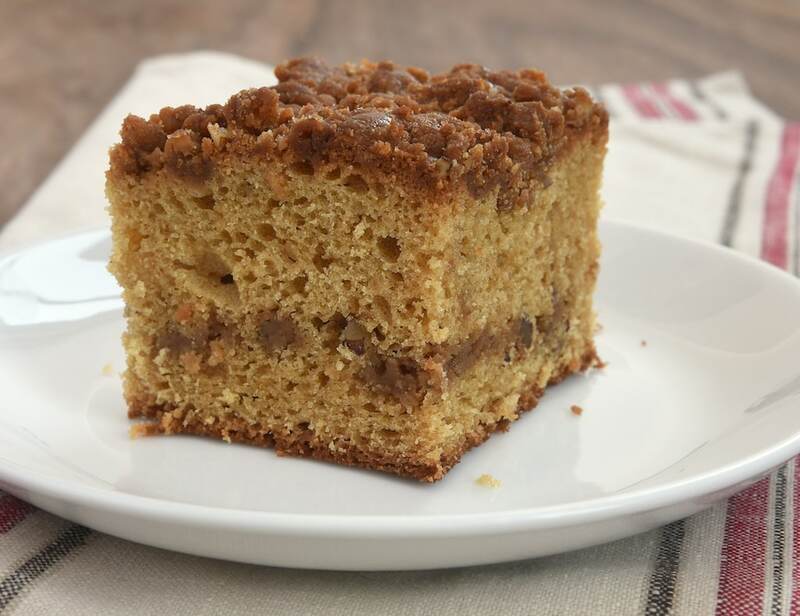 This particular coffee cake has something a little different going for it. Caramel! 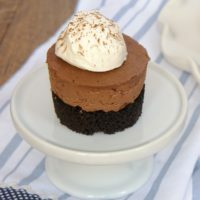 When I found the original recipe, I had one of those I-wish-I’d-thought-of-that moments when I read that there is caramel in the crumb topping. 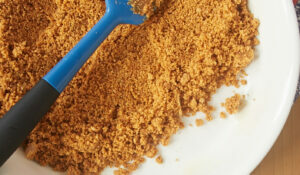 Soft caramels are melted with butter and then mixed right into the crumb for a richer than normal coffee cake topping. I added some pecans for a little crunch and upped the salt a bit, as I do love a salty crumb topping. You can, of course, omit the nuts and/or dial back the salt if you prefer. There’s also just a hint of cinnamon in the cake to make the whole cake package even better. While it’s not a big cinnamon flavor, it’s enough to give it just that perfect little bit of added flavor. I have to confess that Quinn and I kept most of this cake all to ourselves. We both loved the texture and flavor so, so much. Sure, we ate it in our apartment (not on the roof), and I’m pretty sure I was wearing yoga pants and a t-shirt (not a cardigan). But I assure you it was still perfectly delicious. Place 1/4 cup butter and caramels in a microwave-safe bowl. Heat at half power for 2 minutes, then stir. If mixture is not smooth, heat at half power in 30-second increments until melted and smooth when stirred. Set aside to cool for about 5 minutes. 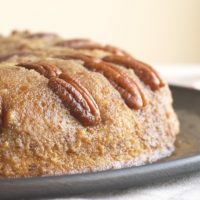 Combine flour, brown sugar, pecans, and salt. Add cooled caramel mixture and mix with a fork until crumbly. Set aside. Using an electric mixer on medium speed, beat butter, sugar, and brown sugar until light and fluffy. Add eggs, one at a time, mixing well after each addition. Reduce mixer speed to low. Add sour cream and vanilla, mixing just until combined. Add flour about 1/2 cup at a time, and mix just until combined. Transfer half of the batter to prepared pan and spread evenly. Sprinkle with half of the topping mixture. Drop remaining batter on top and spread gently. Sprinkle with remaining topping mixture. Bake 50 to 55 minutes, or until a pick inserted into the center comes out clean. Cool in pan for 15 minutes before serving. *I used 13 Werther’s soft caramels. Recipe adapted from All You and MyRecipes. 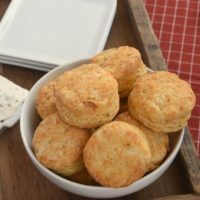 OMG these look amazing! My mouth is watering! Oh yum! 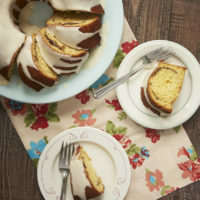 Love the addition of caramel to this coffee cake! The first cake I ever tried to bake at age 14 was a coffee cake to surprise my mother. It was inedibly bitter- I think I forgot the sugar and used too much baking powder. I think I’ll give this one a shot, though. Maybe even take it to Mom! The idea of melted caramels in a crumb topping is great. I wonder if I could make a similar crust on top of a brownie. 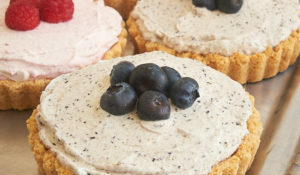 Have you ever tried crumb toppings on other pastries? If so, how did it go? 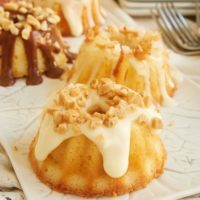 I already love coffee cake, but that topping is making me swoon! Glad you liked them, Elaine! Deelicious, the family loved it! YES! 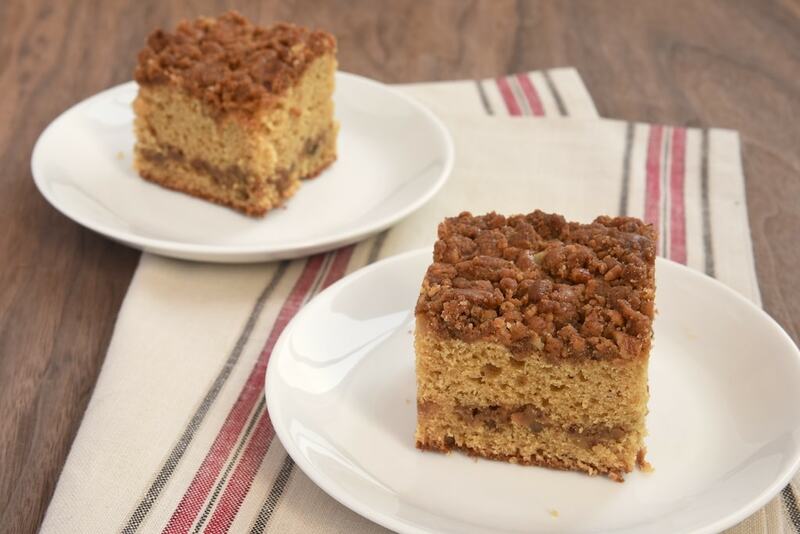 Seriously though….caramel in coffee cake is so genius, I don’t know how I hadn’t thought of it before either! love love loving it! I have about a cup of caramel sauce that I made the other day for salted caramel ice cream. Can I use this for the topping and if so, about how much do,you think I’d need? 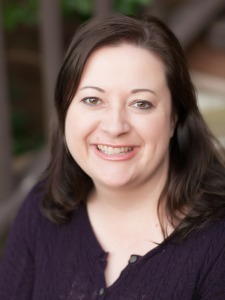 Hi, Kathy. I’d guess about 1/4 to 1/3 cup. I’d start with the lesser amount and add more if needed. Homemade caramel sauce is often thinner than melted caramels, so just keep in mind that the texture may be a bit different.